Forty-three exceptional pianists from around the world have come together at the Arizona State University School of Music on January 13 through 20 to participate in the ninth Bösendorfer and Yamaha USasu International Piano Competitions. 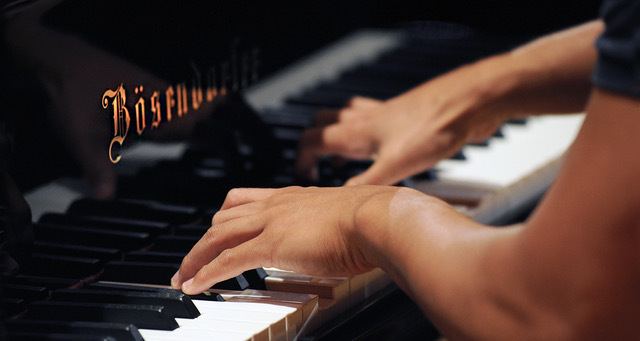 Recognized as among the top piano competitions in the world, the competition prizes include more than $50,000 in cash awards, engagements with The Phoenix Symphony, a recital in Merkin Hall in the Kaufman Music Center in New York and other recital performance opportunities for the top winners. The opening gala for the competition, held on Sunday, January 13 in ASU’s Katzin Hall, welcomed guest pianist Sofya Gulyak, who won first prize and the Princess Mary Gold Medal at the 16th Leeds International Piano Competition in England. All solo performances of the Bösendorfer Competition (ages 19 – 32) were held at Katzin Hall in the School of Music on January 14, 15. The final solo performances will be held on Thursday, January 17. The final round will be held at the Mesa Center for the Arts in the Ikeda Theater at 2 p.m. on Sunday, January 20. The finalists will play a concerto with The Phoenix Symphony, under conductor Matthew Kasper. The announcement of the winners and the presentation of medals and Bösendorfer awards will immediately follow the performance. The semifinal and final rounds for the Yamaha Senior and Junior competition will take place January 16 and 18 in Katzin Hall at the ASU School of Music. The winners’ recital and awards ceremony will take place at 7:30 p.m., Saturday January 19, in Katzin Hall. Also on Saturday, January 19, a question-and-answer session in ASU’s Katzin Hall will be held from 10:30 a.m. – noon where the audience can interact with members of the jury. This year’s jury includes Sofya Gulyak, Leeds International Piano Competition gold medalist; Faina Lushtak, Steinway Artist and professor of music and piano performance at Tulane University; Asaf Zohar, Tel Aviv University professor, Israeli pianist and pedagogue; Zhe Tang, vice dean and piano professor at the Shanghai Conservatory of Music; Robert Hamilton, internationally renowned pianist, recording artist and ASU professor; and Baruch Meir, ASU associate professor of piano and Bösendorfer Concert Artist.